The Brit comments: Welcome to Wendy, our newest contributing author. Wendy lives in the Pacific Northwest and likes big-bold red wines. Wendy here gives hope to all of those who spend too much time at airports. You can follow her on Twitter: @GrnLakeGirl. 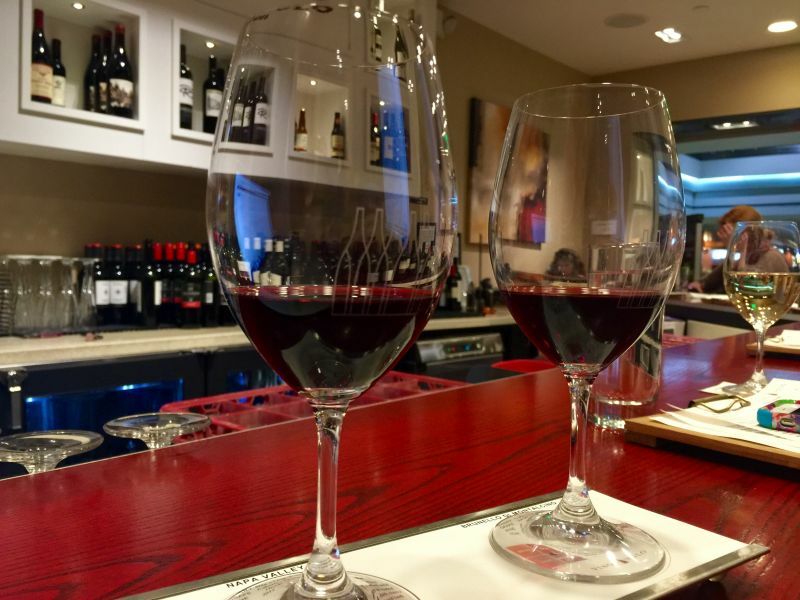 My favorite flights or layovers are where I can get my Wine-on while I wait at Vino Volo. Vino Volo means wine in my mouth, and it serves up a delicious lineup. If you haven’t heard of Vino Volo they aren’t just a place to buy wine. In most of their locations, you can also sit, charge your devices, and enjoy free Wi-Fi while you drink and eat at their wine bar. I spend about a third of my year on the road and, therefore, a lot of time in airports; I seek these locations out. I would recommend setting an alarm on your phone, their chairs are amazing and very comfortable allowing time to pass by all too quickly. Tired of airport food that is overdone and bad for you? Stop here – this is one of my favorite places to grab a warm grilled chicken and goat cheese salad that is fresh and crisp and hits the spot every time you want something on the healthier side. Going for good ol’ comfort food? Grab their mac and cheese – you won’t be sorry. My go-to for a light snack or appetizer are their rosemary almonds and they taste the same whether you are in Vancouver Canada, Detroit, or JFK. Can’t make up your mind from their large selection of wines available? Don’t worry they have you covered. With the Vino Volo wine flights, you get a variety of wines to taste. You can get a crisp white wine flight or a heavy hitting red wine trio. Looking for something with an international flare they have you covered there too. Every wine you try comes with a tasting card, I recommend keeping that card or at least taking a picture of any of the wines you liked so you can remember what you had or even buy it later. My favorite wine flight that I find in most of their locations is the King of Cabernets – this heavy hitting red wine flight will not disappoint if you are looking for a taste of some great cabernets. If you find one in the flight you like, grab a glass and enjoy with your snack, dinner, or just enjoy a nice break with a great glass of wine. 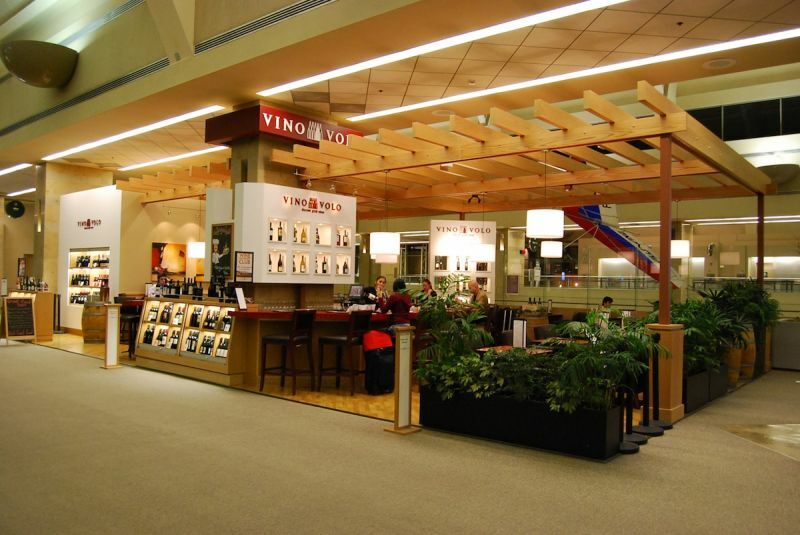 I love having this wine bar at the airport if you are running late and need to grab a bottle of wine to take as a hostess gift – swing by after you land and pick one up. They make a great last-minute gift stop as well. Before you visit I recommend you download their app. Each time you purchase something they will give you loyalty points that are good for discounts. Make sure to check for their members-only wine tastings and offers. For anyone who is a travel and wine geek, don’t stress over your layover. 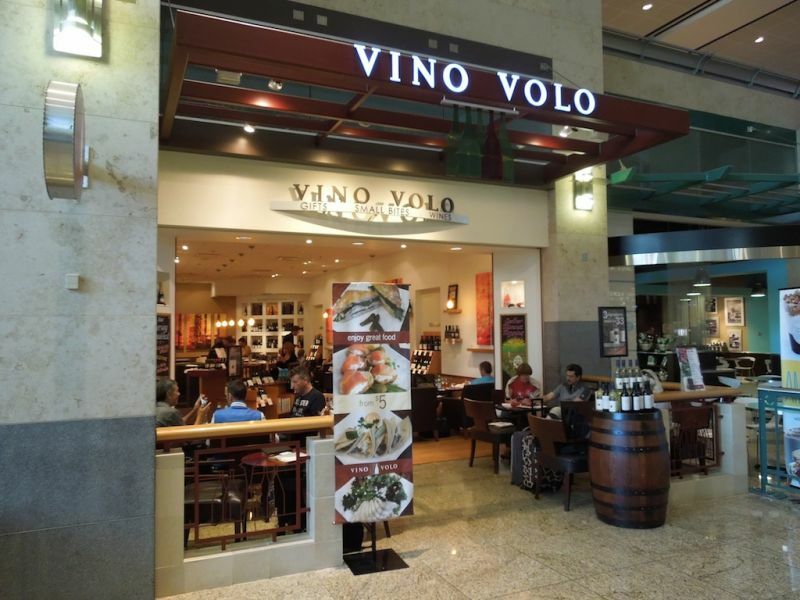 More than likely there is a Vino Volo waiting to make your layover fly by. You won’t need to know where the exit row is for a Vino Volo’s flight that goes down smooth and doesn’t require you to buckle your seatbelt while you are seated. We travel a lot and thank god for Vino Volo…decent wine selection and some very nice nibblies to accompany. Didn’t know about the loyalty program!